It was already an advanced year according to the Chinese lunar calendar, but to Hollywood and its hemisphere it was just around 200 before Jesus was born. China, unknown to anyone in Bethlehem, had been a great civilization since time immemorial. So even as early as the year set as the movie's calendar, it had been spending technological inventions in neverending battles. Hence the so-called 'Warring States Period', equal to the Japanese history's 'sengoku' where Oda Nobunaga emerged from (click here for story and pictures). The Oda of China wasn't a warlord. He was a king, though people said his dad was never more than a roadside vendor. The main source of info about the period comes from the historian Ssuma Ch'ien, official historian of the Kingdom of Han, who wrote it as his own memoir, in jail. So, it's not surprising that since year 1 until 2005 the portrait of the unifier of China has always been unflattering, just the same with Oda Nobunaga's; history, in such cases, was written by the losers. King Sheng of Qin (alternate spelling: King Cheng of Ch'in; 259-210 before Christ) was a young man dreaming a great dream: China had too many kingdoms -- seven of them were the biggest -- and borderline feuds always led to everlasting wars that so far didn't seem to exhaust anyone yet. Naturally he wanted to be the one king under heaven when his China United was to come true. The main characteristic of the future Empire of China is already rendered in this movie: massive and awesome number of employment like those Qin courtiers on the pic above. And they are real people -- the director wants it that real. A born leader, resourceful, excellent swordsman, and equal to the entire Generals of the army combined, King Sheng would become the very first Emperor of China, Shih Huang-ti (which, if anglicized, means exactly what I just said). Because King Sheng always won, one by one of his neighbors fell into despair (but without ceasing to spill any more blood). Countless assassination projects with King Sheng as the target were recorded in the history of China. This seems to be the only thing the other six kingdoms were busiest at. None of these plans worked. 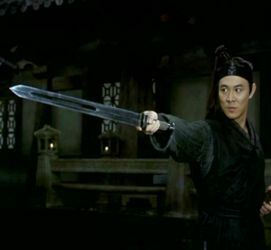 What Zhang Yimou lifts up onto the silverscreen here is one of the dubious tales of such a botch-up whacking job, personalised by Jet Li's typical role, as the low-ranked jobber at Qin's pyramid of bureaucracy. He's an absolute orphan left by gods knew whom, so people called him 'Nameless' ('Wuming' in Chinese), and he likes this name since the manifested anonymity gives him immunity from scrutiny and invisibility he craves for the assassination project. Chen Daoming could have been a real-life Emperor if he wasn't born so too late for such a thing. 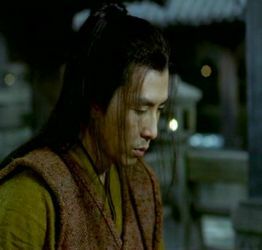 He gives us the most exquisite portrayal of King Sheng, in the atmospheric surety that one of those days he would finally be Emperor Shih Huang-ti. Chen does this without even discounting humanity from the whole packaged personality he is to give life to. He makes Jet Li's "Yes, Your Majesty" sounds true each time around. Nameless can't kill the King unless he can get close enough to him. And getting close to the great king of Qin, whose daily routine includes attempted coups and assassinations, is no piece of cake. So Nameless got to go a long roundabout way to arrive at 10 paces away from the target: by claiming rewards for successfully slaying the enemies of the state. The Qin cops at the public chess house are watching closely over the famed assassin Changkong (literally anglicized, it would be 'Horizon', but here it's transliterated as 'Sky'). Virtually a whole precinct came down, since Sky is not a mere conman that can be handled by anyone. It's so lamentable that Donnie Yen doesn't get enough time onscreen here. You can only catch a glimpse of his trademark lupine charm. Here he uses a rather much-decorated spear. No one can beat Donnie Yen in real-life kungfu, but you have never even heard of him! Donnie Yen left Hong Kong movie industry years ago, and has been working in the U.S. as director of fighting scenes in action flix and games. The excellence of the videogame Onimusha (Sony Playstation) is partly owed to Yen's directing. Click here for scenes of the game, whose main character is based on Japanese coolest actor Kaneshiro Takeshi. This is the first time ever that Yen shares a screen with Jet Li after ten years. Li himself is also a real-life fighter, unlike Chow Yun-Fat. 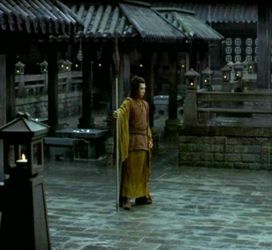 Asian movielovers find scenes like this very familiar; it is a typical, routine, predictable kung-fu thing -- just like every move in Ang Lee's Crouching Tiger, Hidden Dragon that shook Americans so much but never impressed Asian audience who has seen the very same thing for 25 years before that movie was even thought of. But this is Zhang Yimou's flick. 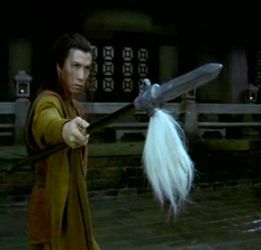 He and Donnie Yen deliberately put the boring action stuff (boring to Asian audience, at least) to sew together the known and the unforecasted. You'll know what I mean if you watch this movie yourself. One of the many haunting scenes in this movie: the array of bureaucrats and courtiers at the Palace yard. Zhang Yimou made the entire thing, not just used the available real palace. And all those people are real people, not computer-generated critters. The director has a solid reason to entirely build the thing himself; in this color-coded movie, black is death and destruction -- so is the Qin's Palace, so is the King of Qin -- seen thru their enemies' eyes. And these are real warriors -- of the People's Republic of China. 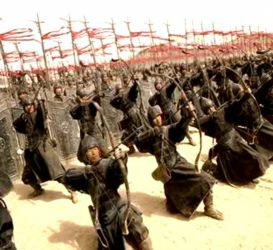 Zhang Yimou involved the Chinese Army in providing extras like these; shot up-close, they are convincing, since they really are professional soldiers. The Kingdom of Qin has been known as the most spartan and military-minded in the history of China. Their best thing is bows and arrows. Zhang portrays this splendidly in this movie. The Great Wall of China, the ancient Xian palace, and the terracotta soldiers, are the most familiar things about China that all the rest of the world knows about; just to remind you again that they are all relix of what Emperor Shih Huang-ti, which this movie's King Sheng would eventually be, have built in his times. So, it is most likely that you have brushed shoulders with the real-life King Sheng without knowing that you have. That's the official portrait of Shih Huang-ti at the far right.